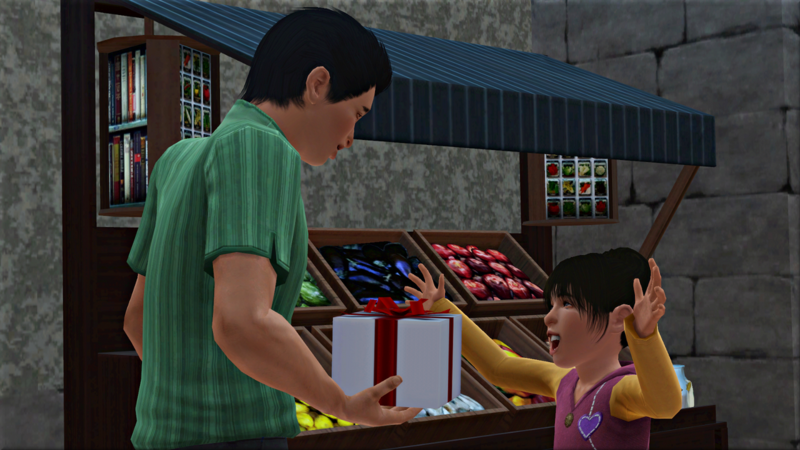 Gang bought his daughter some plums and links from the food merchant. These make great bait for kawarimono koi and red herring. Mei was able to catch both types. Her lifetime wish will be to have a perfect aquarium. 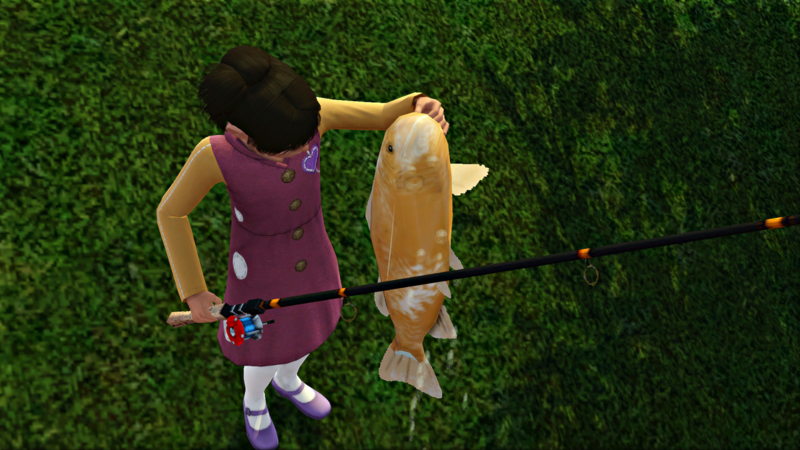 So far the only fish she’d caught at perfect quality was the doitsu koi, with the excellent pomolos she’d found at the harvest stand the day before. For the higher level fish it will take some more practice, and probably better quality bait than the standard food merchant fare. Mei spent the whole day fishing, reaching level five. 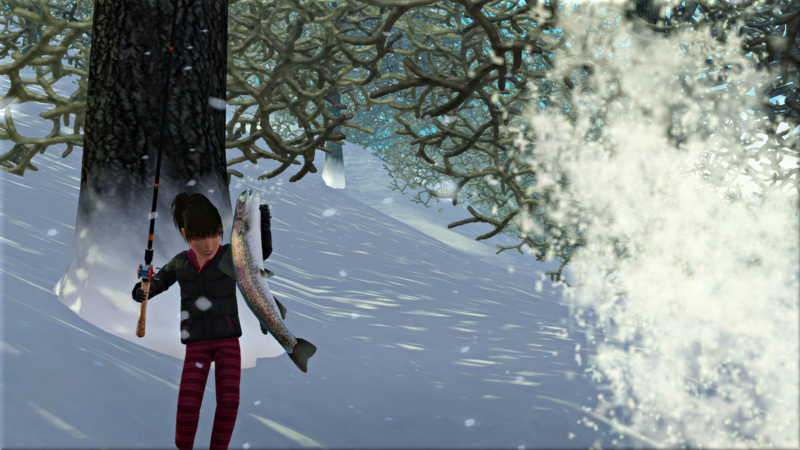 She could now use her pomolos for ochiba koi, but dinner time was approaching and there were none swimming nearby, so I decided that could wait. At home, Mei discovered her mounted fish had arrived. 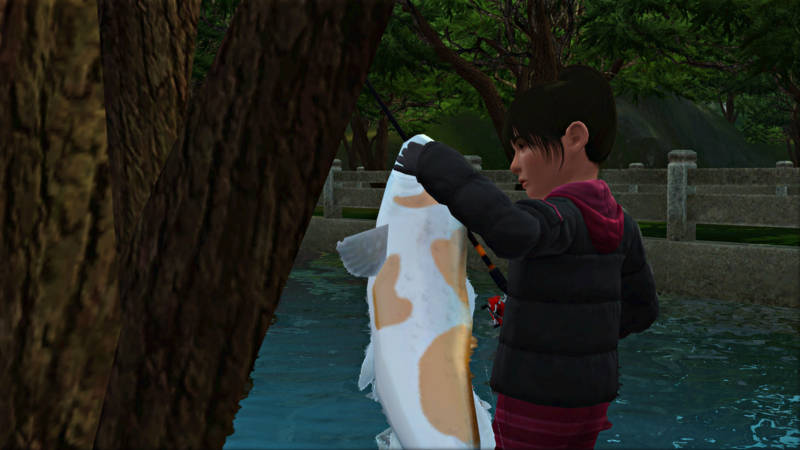 This was the first she ever caught, the 15 kilo doitsu koi. She tagged along with her mum to a party that evening, at their second cousin Jee Young’s house. 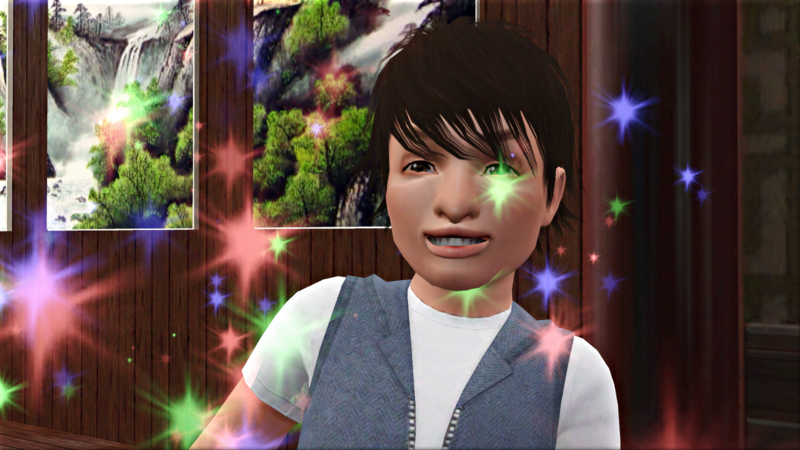 Mei made friends with the host’s daughter Guan-Yin. Her dad couldn’t make it to the party. He had a ghost hunting job at Lin and Dara’s house. Mother and daughter didn’t stay out late. Jia was heavily pregnant by this point and I wanted her home before the baby came. It was around 3am when the contractions began. The baby was a girl, Qui Yuan-Kim. She’s a genius and loves the cold. 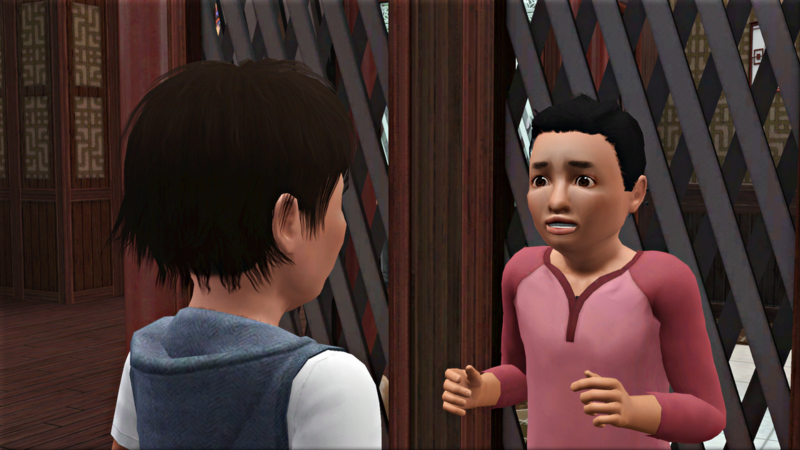 Zhen—Jia and Gang’s middle child—had a birthday the following day. He rolled the daredevil trait. 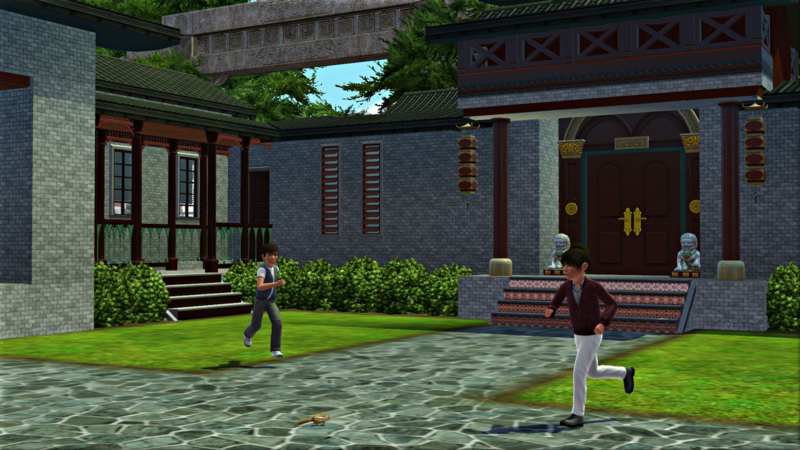 Zhen got to know some of the other kids, and played a game of tag with his big sister. 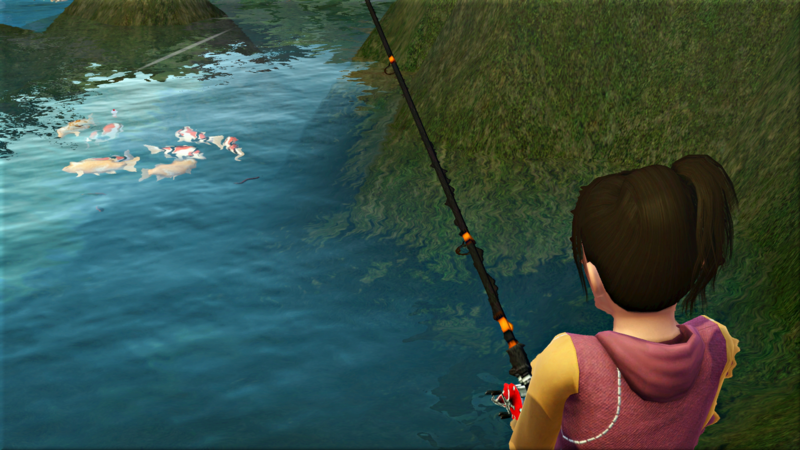 Mei took her brother fishing with her at the first opportunity. 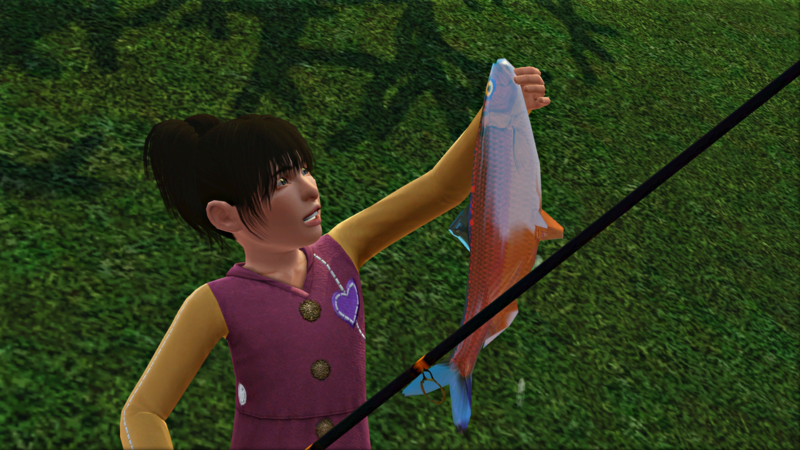 She managed to catch that ochiba koi. She got some more goldfish too, perfect quality, which she used to bait her first black goldfish. With Jia and Gang, I continued to experiment with the dream pod. Gang’s positive ‘dream about heroism’ would have given him the brave trait if he didn’t already have it. For Jia, ‘fun in the water’ temporarily replaced daredevil with sailor. I expected a bit more drama from the dreams really: so far there have been few negative outcomes, even when Gang’s advanced technology level was low. Some of them do give me fun ideas for things to do though. 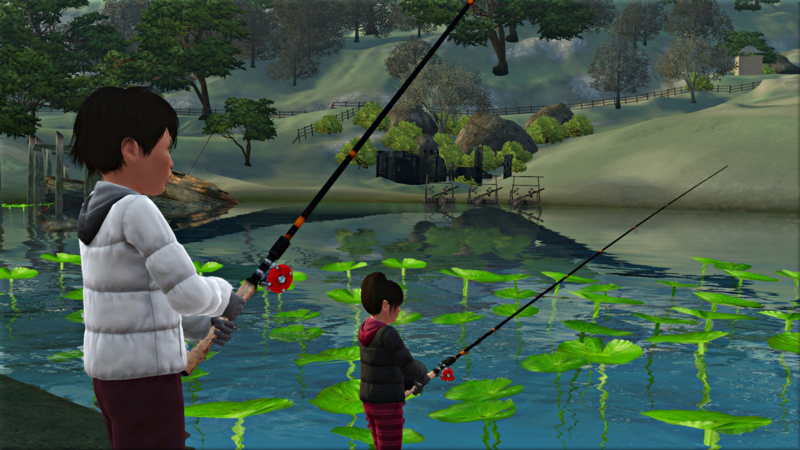 In this instance, Jia’s trait switch inspired me to buy the family a boat and send mum and dad out for a morning on the river. 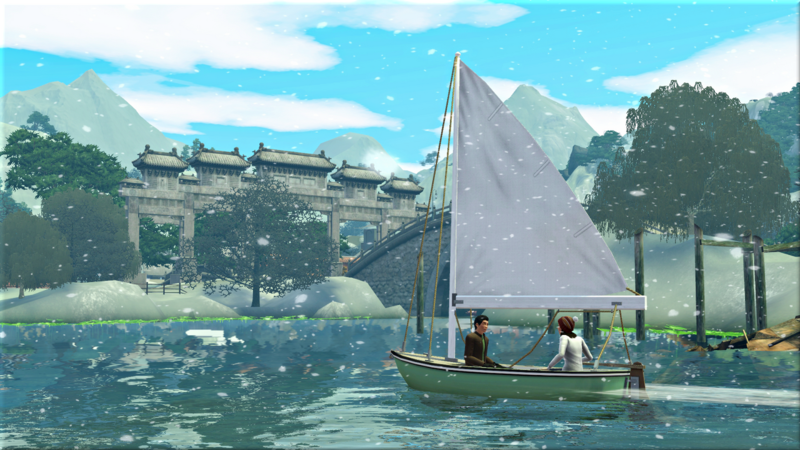 Shang Simla always looks beautiful in the snow. 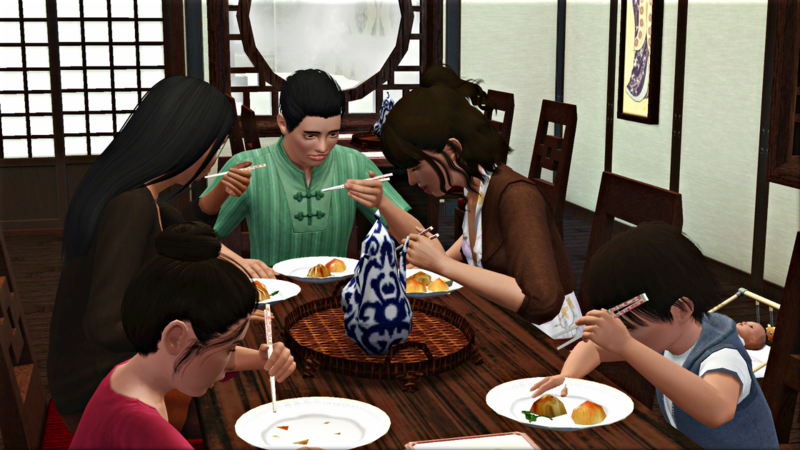 Not wanting the kids to stay out in the cold all day, I had the whole household take Gang’s sister Huang out for lunch. The snow wasn’t deep enough for Mei and Zhen to build anything, but they had a fun game of tag. It wasn’t so chilly the following day, though still not warm enough to melt the snow. 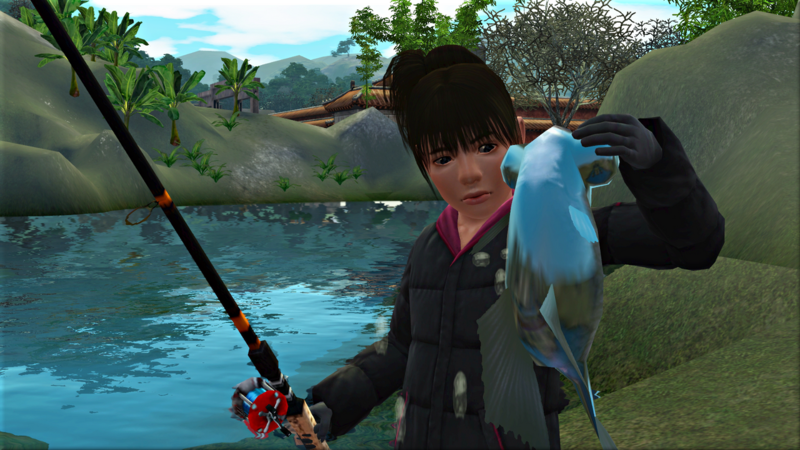 Mei caught some minnow, rainbow trout, salmon, and tancho koi, though only the minnow included any perfect quality. That was quite enough for one day. 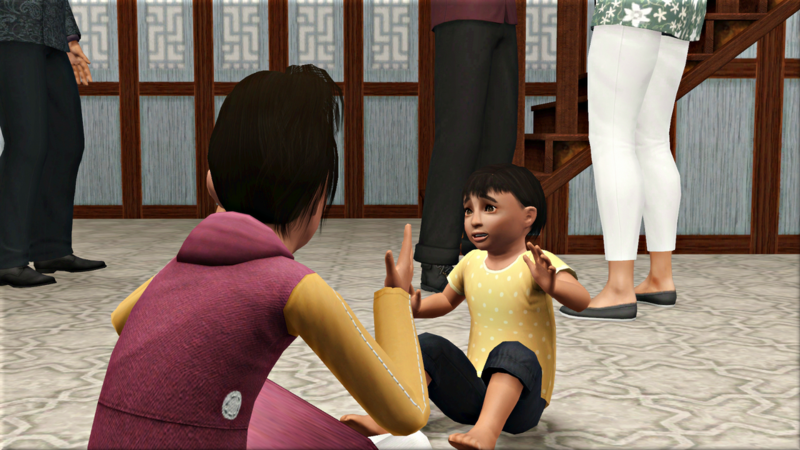 After some hot plates of synthesized food, Mei and Zhen spent a few hours playing with their little sister Qui. Haha I know right. I do love the models for the fish though. I’m pleased the devs went to the trouble of making different ones for each type. LOVE the triptych painting on the wall. 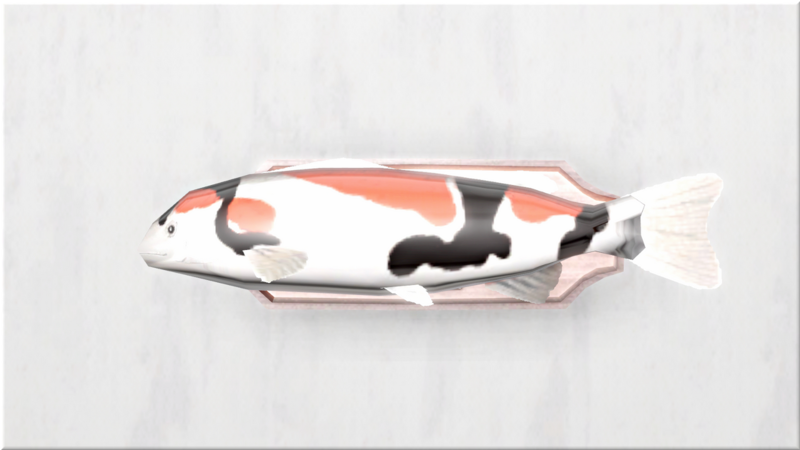 Wow, that mounted koi is so beautiful! And I just love the sailing pic! I think so too! 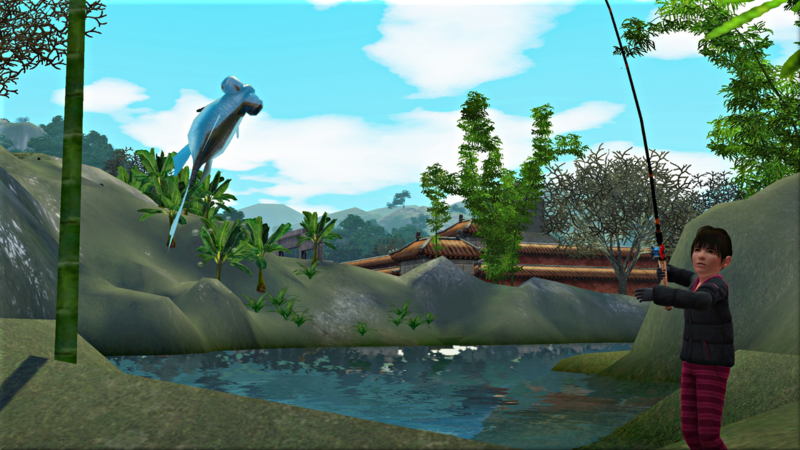 I do enjoy getting wall-mounted fish, especially for the really unusual looking ones like the dragon fish and robot fish.